for the region active in star formation. Take notice that this power is very close to that of the global Schmidt law [eq. (3.4)] The threshold surface gas density ranges from 1 to 10 ( ). 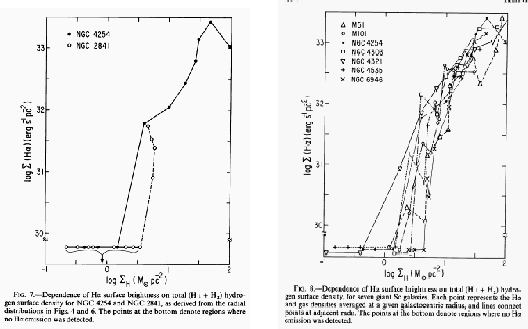 Therefore, theory of star formation must explain (1) the Schmidt law (clear correlation between star formation rate and the gas surface density) above the threshold column density and (2) the fact that there is no evidence for star formation in the gas deficient region below the threshold column density. Figure 3.2: Distributions of and . (Left:) Relation between and for an Sc galaxy NGC 4254 and an Sb galaxy NGC 2841. (Right:) Relation between and for various galaxies. These are taken from Figs.7 and 8 of Kennicutt (1989).